Memory jugs. This is an idea whose time has come for the Modern Woman. First, a brief art history lesson: Memory jugs, or memory jars, or memory vessels, if you want to sound fancy, have been around a long, long time. 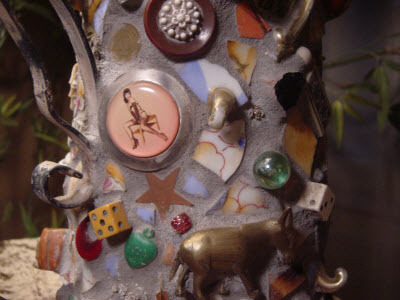 Basically they involve embellishing a bottle, jug or crock with an accumulation of smallish items – buttons, medals, pieces of broken china, game pieces, doll parts, you name it – that have associations or evoke some memory of a person or event. Some historians say they have their origins in Southern Black communities, while others claim that no, it was really the Victorians with their sentimentality-on-steroids that we have to thank for this phenomenon. But let’s let those two camps argue amongst themselves and get on with making something fun. I urge you to get yourself down to the nearest big-box craft store and find yourself a jug that you can cover with the flotsam and jetsam of your own life. (That’s what I did. The jar I used looks old, but it’s that faux-old that can be had for under ten bucks, if you hit a sale.) Get some grout, too. That jug you buy is, of course, simply your blank canvas. By the time you’re done attaching all your own sentimental stuff, and then grouting it, there won’t be much of the original container visible. (By the way, prepare yourself for the grouting part, it takes way longer than you’d think to work around all those oddly shaped and angled objects.) When you’re done, however, you have a remarkable piece that you wouldn’t part with for a million bucks, because that’s your life on that thing, and it’s beautiful. And only you need to know the stories behind it all.